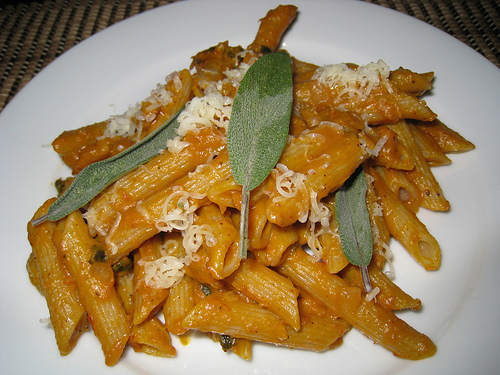 I still had a cup of pumpkin puree left and I remembered seeing this post based on this recipe for a pumpkin pasta which sounded pretty interesting. The sauce was a pumpkin and sage sauce with some of the spices that are commonly combined with pumpkin and chili sauce for some heat. I have been using and really enjoying sage a lot lately and I was interested in seeing how it combined the pumpkin. I added the sage leaves to the pan a bit earlier so that they could fry up a bit in the oil. As I often do I added a teaspoon of the chili sauce and tested the sauce to see how it was. I ended up adding an extra teaspoon of chili sauce to bring it up to the level of spiciness that I was happy with. The pasta turned out pretty good. The pumpkin sauce had a nice blend of spices, spiciness, creaminess and sage. That was the last of my pumpkins. I think I went through about 6 pumpkins this year and I really enjoyed them. I used them in a wide variety of dishes from sweet to savoury. The pumpkin has proven itself to be very versatile. There are still a bunch of pumpkin recipes in my bookmarks to try the next time I get some more pumpkins. Cook the penne as directed. Add the shallots and sage and saute until the shallots are tender, about 3-5 minutes. Add the chicken stock, pumpkin puree, heavy cream, chili sauce, nutmeg, cinnamon, salt and pepper and simmer for 5-6 minutes to thicken. Plate the pasta and garnish with parmigiano reggiano and sage leaves. You really have 101 ways to use a pumpkin! Clever. I agree with Tigerfish. Another perfect use of your pumpkin!! !Very tasty! Good choice of pasta, the penne sticks to that thick sauce. I have really been craving this since I had it. I’m glad you gave it a try! I am now crowning you the Pumpkin King! You and the pumpkin recipes, Kevin… All of them are irresistible! Kevin, I’m making a Donna Hay version of this tomorrow! I’ve still got a lot in the freezer – This sounds great! I might add a bit of ham or spicy sausage for dinner. Great idea with the chili sauce! It sounds good to me! I think sage goes very well with every type of winter squash, it’s one of my favorite combinations. I’m with Kalyn, winter squash and sage are a perfect combination. This looks delicious! I made this for dinner with just a few tiny changes–wonderful! Really creamy with none of the guilt. ooh this sounds good. Sage leaves are also AMAZING when you fry them in a little oil—like sage-scented potato chips. A great garnish. And our sage plant is out of control. I just tried this recipe (with a few changes) and absolutely loved it! Although I’m sure your version is creamy and delicious, I tried for something a little lower in fat, and it totally worked! My version is over at my blog if you’re interested… thanks for the recipe!!! I was looking at how good this recipe looked and sounded…but I thought "this is vaguely familiar". Aha! This is a Rachael Ray version…and I remembered that I made her version of Pumpkin & Sausage Pasta– same ingredients, only with Italian sausage. I use spicy turkey sausage. Great recipe! Thanks for reminding me of it. This was very good thanks for posting! The boyfriend made this recipe for me tonight and it was delicious! Thank you for posting it up! Who knew pumpkin made such a delicious pasta sauce?